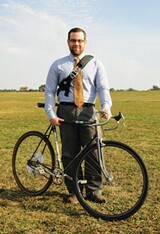 City of Memphis bike coordinator delivers congressional briefing on bike lanes. 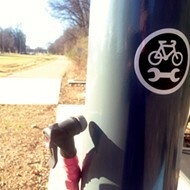 Memphis received an ovation for the city's bike-friendly upgrades at a congressional briefing last week. 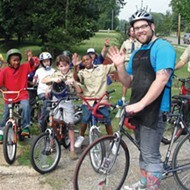 Kyle Wagenschutz, bike-pedestrian coordinator for the city of Memphis, appeared before Congress last Wednesday to make a presentation on Memphis' participation in the national Green Lane Project administered by the Bikes Belong Foundation. "It was awesome. The room was packed," Wagenschutz said. "We were talking about where Memphis had been before 2010. We talked about what we'd done since, and mid-presentation, the group gave an ovation on the progress that Memphis has made so far." The Green Lane Project connects six cities — Austin, Chicago, San Francisco, Portland, Washington D.C., and Memphis — in a quest to provide for more innovative bicycling design and increase the number of people bicycling with respect to each city's unique challenges. Federal money for cycling infrastructure has poured into Memphis over the last few years, in part because of Mayor A C Wharton's focus on reversing the city's former reputation as one of the worst cities for bicycling in the United States. That focus included the creation of Wagenschutz's position as bike-pedestrian coordinator in 2010. 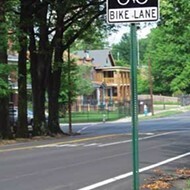 Since then, nearly $1 million of stimulus and other federal funding has gone into creating 50-plus miles of bike lanes. Bicycling magazine, which named Memphis one of the worst cities for cyclists in 2008, turned around in 2012 to name Memphis the most improved city for bicycling. "We've made a lot of progress in a very short period of time," Wagenschutz said. "We've added more than 50 miles of new bike lanes in two years. That's a level of progress that's really unheard of." Wagenschutz had only 10 minutes to speak before Congress on the progress Memphis has made. "What I really focused on was why Memphis sees cycling as a priority," he said. "I basically had two main points: It's a logical decision for us in terms of completing our transport system and that 30 percent of our city's residents are obese and 60 percent of the adult workforce is obese. So it's an economic development tool for recruiting businesses to come to the city." After covering Memphis' progress, Wagenschutz turned to what Memphis cyclists have to look forward to. "I talked about the Overton-Broad connector, the two-way protected bike lane design around Tillman and Broad, and how we've been able to identify some federal funding in the implementation of that design, which we hope to begin next spring," Wagenschutz said. 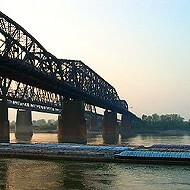 "I also briefly mentioned the Harahan Bridge Project, because there's a lot of work that happened at the federal level to get Memphis the grant for that project. 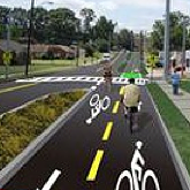 It's another really great example of a facility that will increase the number of people bicycling and walking."